Nowadays, searching the right set of Olympic set for your gym or home is not really easy, typically due to the fact that wide range of varieties of weights with different specifications are readily available in the market and on internet. Some people look for coated weights, some go for cut-outs or even for specific types of handles and grips, while some of them pretty much like traditional old-school range of weight. If you want a good quality Olympic weight set, then I would recommend you the 300 lbs. 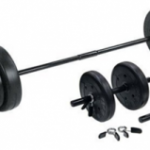 Standard Olympic Weight Set by USA Sports which can certainly meet your desired needs. This is a very traditional looking set that consist of all of the features and specifications in a very affordable price. The set includes a 300 pounds of weight stack with a seven foot long Chrome bar along with two Olympic Spring lock collars, to fulfill your desired expectations. They are manufactured and designed in such a way that they are compatible for any home gym, but are mostly recommended and used in commercial gyms more. The reason for that, is due to the fact that these plates are easy to grip and handle having raised edges which are designed to last a very long time. The barbell provided with USA Sports Olympic weight set is made up of solid Heavy-Duty steel, with chrome coating, and having an etched finish. 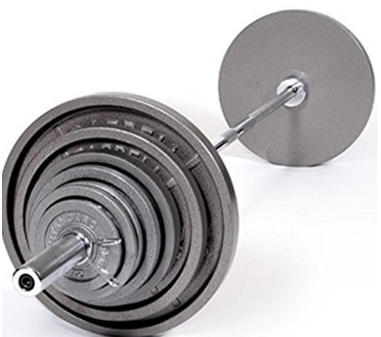 It’s a standard seven inches long Olympic barbell, having two inches of sleeves, which are compatible with Weight Sets Review plates having two inches of plate holes. The weight of the bar without any additive plates is 45lbs. which may become a certain warm up for most of the beginners too. However, the barbell is rated to withstand a weight up to 600lbs. and since it’s made up of solid heavy-duty steel without having a hollow, it won’t bend or break even with this weight and will continue to perform readily with all functionalities. Hence, making the set of 300lbs. pretty much upgradeable if you require some additional weight in future. By purchasing extra set of plates to make your progress and desire a superior one. 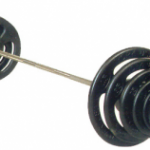 The sleeves of the barbell are pretty much simple and are not threaded. The locking of plates on the bar is done through EZ- On Spring Collars which are provided in a pair with the set. 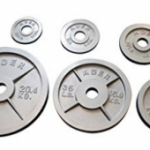 The weight plates which are provided in a set consist of a gray enamel finish, which makes them pretty much durable and doesn’t comes off until and unless the plates are consistently dropped on a rough surface with a certain height and power. The plates are standard Olympic ones, having two inches of diameter. The edges are cut and shaped in such a way to make loading and unloading along with handling pretty much easy. Though, on each plate, the proper weight in both pounds and kilograms are specifically marked to make the selection pretty easy for the user. The adjustment system of weight plates is pretty much traditional and classic since it’s a barbell set. Though, the locking of weight plates is done through spring lock collars not threaded collar, as done in a CAP Barbell set. Making the adjustment system easy as the springs are easy to remove and re-lock. In a set of 300 pounds of USA Sports Olympic Weight Set, there are two 2.5lbs. weight plates, four 5lbs. weight plates, two 10lbs. weight plates, two 25lbs. weight plates, two 35lbs. weight plates and two 45lbs. weight plates. Along with them, the weight of the barbell is itself 45lbs. so that becomes a starter weight too. You can further make the adjustment increment by five, ten, twenty, fifty, seventy and ninety pounds. With the further option of purchasing some extra additional weight plates too if you may need in future. Therefore, not every Olympic weight set will have such particular specification and configuration of weights, as most of the weight barbell max out with only the weight which is provided within the set. But not in USA Sports Olympic weight set, as it gives you authority to add further weight too which is why they are one of the most popular and certainly the one which can be used to make your lifting career started in either at gym or home. Chrome Olympic Bar having a maximum weight plate capacity of six hundred pounds. USA Sports 300 lbs. Weight Set Includes 14 USA Weight Plates: 2x 2.5 lbs., 4x 5 lbs., 2x 10 lbs., 2x 25 lbs., 2x 35 lbs. and 2x 45 lbs. 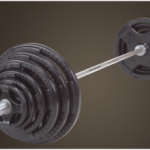 Standard Cast Iron Olympic Plates coated with Durable Grey Enamel Finish. Plates are stated with numbers and letters of desired weight to make the selection easy and fast. Cut and shaped edges to provide comfort. Bored holes through machines, makes the plate easy to carry and facilitate while loading/unloading. 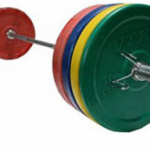 Weight set comes with one seven foot Olympic bar made up of Chrome, with a sleeve diameter of two inches. Provided with two EZ- On Spring lock collars to hold plates securely on the bar while lifting. The time when I purchased and started using these weight plates by USA Sports, within few weeks I observed a lot of progress on my body as It started turning to come in a proper shape which I desired. Coming with the enough variety of weight plates, I especially use the 2.5lbs. Weight Sets Reviews as it makes my increment go easier up to 5lbs. 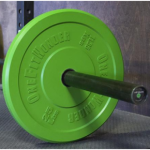 The barbell is made of high quality and makes the plate rotate independently from the grip portion of the bar. Thus, making the movement stable and the setting with plates are on the floor. 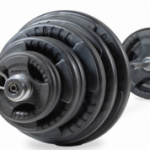 These weights comes with a free shipping hence, making your budget more affordable overall. However, the transportation cost is added with the cost of USA Sports Olympic weight set at the time of purchase when you are ordering from some certified and renowned website like Amazon, Walmart or EBay. Though, these are certainly very good choice of weight set if you are finding a low priced Olympic weight set. It consist of merely all the features, as of high priced weight set. Coming with high quality and meeting the standard Olympic Specifications, USA Sports Olympic weight set is trusted to give you a long lasting durability. However, it is still recommended to have an additional floor padding to protect the floor as the floor can be damaged by the heavy duty Cast Iron plates. Comes with a great variety of weight range. Gives an old school, traditional look. The etched bar gives a very secure, firm grip. Very affordable, with this range of set provided with a good quality. Adjustable of adding weight up to 600lbs. No Rubber Finishing which can make the weight plates not very much durable. 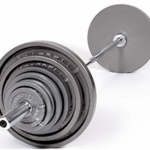 Weight plates may chip off if the plates are consistently drop. Set comes with heavy duty steel plates not bumpers, so floor padding is required to prevent the plates damaging the floor. Gives a much lower quality when compared to big brands like Iron Max and Rogue.